The Donut Directory: Beignet? ...Why yes, thank you. Beignet? ...Why yes, thank you. 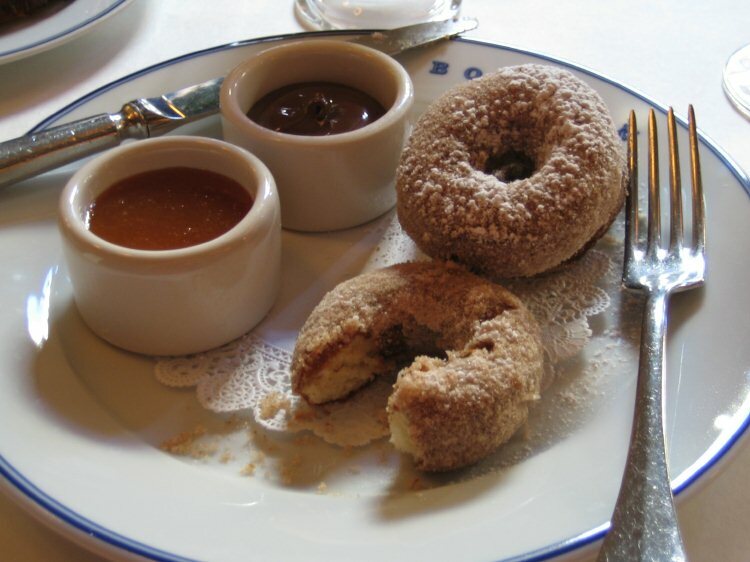 A beignet, which is French for "fried dough" in the U.S. is a pastry made from deep-fried dough, much like a doughnut, and sprinkled with confectioner's sugar, or frostings. 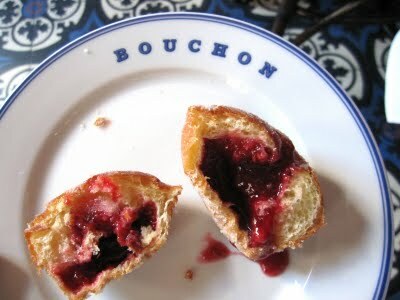 Versions of beignets are also popular as an appetizer, with fillings such as maple or fruit preserves. 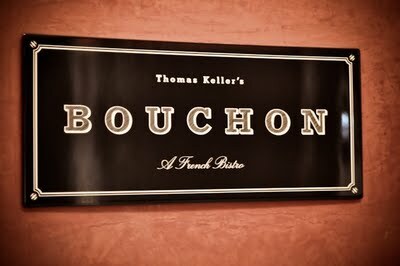 In Las Vegas, there is one place that does the delectable French pastry like no other- Bouchon - the popular Venetian eatery opened by Thomas Keller (of French Laundry Fame). While attending a recent conference for work I was cordially invited to brunch with several colleagues. 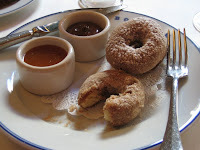 Not expecting to find donuts, or their French cousin Beignet on the many foraging trips we partook of, I was shocked if not pleasantly surprised when the waiter asked..."Would you care to sample our Beignets?" Would I? Does a Dog want steak? Does a cat want tuna? Do we all need oxygen to breathe??? Why of course, thank you! Upon our waiters return my colleagues, being a health conscious bunch, were at first hesitant to partake. However, the first bite was quickly preceded by a veritable stampede of fingers, knives and trail of miniscule crumbs. Resembling the size, coloration, and weight of an Apple Cider donut, the Beignet’s slightly crunchy exterior is covered in a spiced sugar provided a perfect balance of sweet and spicy. The inner cake is light and fluffy. Ample side spreads of apricot and chocolate are provided for those who care for and extra tasty treat, or simply order the raspberry filled for one of the best little jelly donuts…I mean, beignets around. As we only ordered the cake on this trip, I'm looking forward to ordering a double of raspberry filled to compliment my espresso on the next visit! These are referred to as Lady Fingers down on LI...a restaurant I worked for once served them. Simple yet yummy! the branding and eyelets. The Nike LeBron Soldier cheap mbt shoes 10 stands out thanks to gold speckling throughout michael kors outlet a clean white base while icy bottom adds michael kors sale the perfect finish to the understated offering. Interestingly Nike Roshe Run enough, the KD 9 and LeBron Soldier 10 kd 8 each feature bold ‘USA’ callouts while the Kyrie Nike Outlet Store 2 is absent of any American abbreviation.As of kobe shoes today, Team USA is 5-0 during the Rio New Jordan Shoes Olympics competition, although the past couple of games mbt shoes for men have been incredibly close raising questions of whether Cheap Nike Air Max the red, white, and blue will be able fitflops sandals to win yet another Gold Medal. Do you kd shoes think Team USA will be able to bring Nike Shoes home the gold? There’s been a countless Cheap Jordans number of “Triple Black” sneakers released over the mbt last couple of years, but it’s hard to Nike Store get tired of the all-black concept when the Nike Shoes look lands on great new sneakers like this. Nike Air Max The murdered out color scheme comes next to Nike Outlet the premium Air Presto Woven, which sports nothing michael kors outlet online but black from top to bottom for the Nike Factory Store woven upper, matte-finished midfoot and heel TPU panels, Nike Store and sole unit. The Air Presto Woven “Triple fitflops on sale Black” will be hitting Nike Sportswear retailers soon.